On December 9, lawmakers of the South Korean National Assembly passed a historical motion to impeach the current president Park Geun-hye. 234 out of 300 legislators in the National Assembly voted in favor of the impeachment motion. Now that the National Assembly has passed the motion to impeach Park, it is up to the Constitutional Court to decide whether to make the impeachment final in accordance with the constitution. Park will be suspended for the time being as the Constitutional Court deliberates. During this period, the current Prime Minister, Hwang Kyo-ahn, will serve as the acting president. In order for the impeachment to go officially in effect, six out of the nine judges of the Constitutional Court must agree to rule in favor of the motion within 180 days. And if Park is ruled impeachable, she will be removed from office and investigated (and possibly prosecuted) for her involvement in the government corruption scandal. Consequently, she would be stripped of privileges normally granted to former presidents including a pension and government-provided security detail. 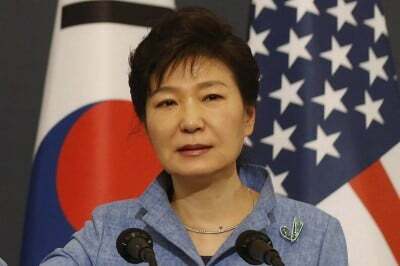 South Korea can also expect to see a presidential election within two months following Park’s removal from office. This is a clear victory for the South Korean people, who made history – and international headlines – in recent weeks by converging in record numbers in mass protests. They marched, danced and encircled the Blue House, some with torches, most with candles, invented new songs and drove tractors across the country to voice a single unified demand — the ouster of the president. Along the way, they invented new forms of protest, which rabble-rousers around the world might look to for inspiration. The following are some of the ways they pressed the National Assembly to vote to impeach. “Parkgeunhack.com” is a user-friendly website created for the purpose of getting South Korean citizens to urge their representatives to vote in favor of impeachment. The site helps people to contact their National Assembly representatives via e-mail, social media and phone and provides an online petition form on which they can write messages to their elected officials. The site also provides information on which of the lawmakers have responded to the petitions and whether they support or oppose the impeachment motion. The site went live on December 4, one day after the mass demonstration that brought out a record 2.32 million South Koreans across the country to demand the president’s ouster. Within just a few days, close to a million people had petitioned their representatives through the site. On November 30, The Minjoo (Democratic) Party lawmaker and police studies expert Pyo Chang-won, released on twitter a list of Saenuri Party lawmakers’ names and each of their positions on the impeachment motion. Soon after, an unidentified citizen tracked down the personal cell phone numbers of Saenuri representatives and organized them into a google spreadsheet, then posted it on social media for all of South Korea to see. Thousands of South Korean citizens referred to the spreadsheet to send text messages to Saenuri lawmakers to demand they vote to impeach Park Geun-hye. Saenuri lawmaker Kim Moo-sung reportedly received over a thousand text messages on his private phone over the course of a few hours on December 2. Other Saenuri representatives also received hundreds of similar text messages on their mobile phones. Exactly at 2pm everyday, masses of online users have been visiting the main website of the Blue House in an attempt to crash the site. Earlier this week, the Blue House posted a warning that attempts to crash the site by overloading the site traffic is illegal. This week, farmers launched a tractor procession to Seoul for the second time in the past month. The “Jeon Bong-jun Battle Group,” named after the revolutionary leader of the 1894 Donghak Peasant Revolution and composed of members of the Korean Peasants League (KPL) and the Korean Women Peasants Association (KWPA), organized over two hundred farmers from across the country for a three-day tractor procession from Pyeongtaek to Seoul. The convoy departed early afternoon on December 8 and arrived at the National Assembly building in Seoul on Friday December 9. In November, the Jeon Bong-jun Battle Group launched its first tractor procession from the southern regions of South Korea and headed to Seoul to join the mass demonstration on November 26. As the procession neared its destination, the police prevented the farmers from entering the capital city. Due to excessive force by the police, several farmers were injured and rushed to the hospital. Thirty-six farmers were arrested. On December 10, farmers of the Jeon Bong-jun Battle Group will try again to drive their tractors all the way to the Blue House. And of course, the most important of all were the massive candlelight actions that filled Gwanghwamun Plaza and the side streets leading to the Blue House every weekend. They were the culmination of years of conscious and deliberate organizing by workers, farmers, the urban poor and students who came together to build a broad-based and inclusive united front. The National Assembly has voted to impeach Park, but the fight is far from over. The mass movement will now need to shift its attention to the Constitutional Court, which has 180 days to deliver a ruling on the impeachment. It needs to ensure that the Constitutional Court delivers a just and expeditious verdict as well as tend to the greater task of unifying around a people-centered, democratic agenda to determine the next leadership in the Blue House.